Inside a warehouse at the Brooklyn Navy Yard, steel beams and flat metal sheeting rest atop a workbench. A diagram–which looks an awful lot like furniture assembly instructions–spells out where each beam and metal screw belongs. On it someone has carefully checked off each component, one by one. 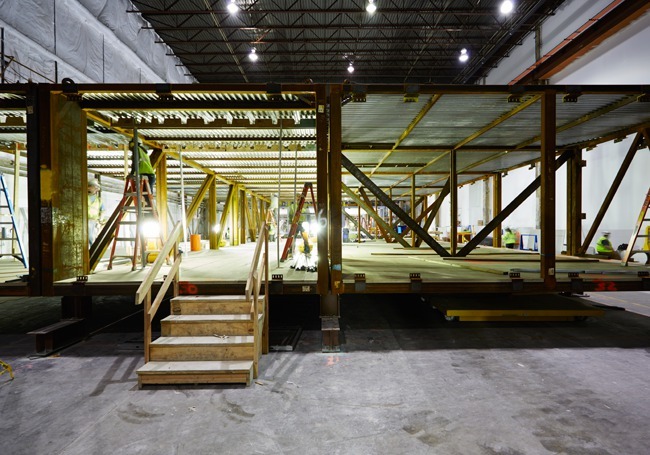 The metal may not look like much yet, but it’s on its way to becoming part of the world’s tallest modular residential high-rise. Workers will configure these beams into walls, which will become the scaffolding of rooms, which link together to form entire apartments. Then the “mods” are loaded onto a truck and driven 2.5 miles away, lifted by crane and snapped into position like Lincoln Logs. Time to load an apartment: 30 minutes. From the first cut of metal to placing a mod on its final site, the entire process takes about 20 days. “And we’ll get faster,” says the VP of Swedish construction giant, Skanska. “This is bringing the best of manufacturing and construction together.” The first 32-story tower is slated for completion in December. Skanska is counting on the new factory approach to urban construction to save on costs and provide greater quality control, writes Forbes (May 5, 2014). A 1,000-square-foot apartment in NY costs an estimated $330,000 to build; Skanska estimates it will knock 15% to 20% off that this go-round–and as much as 30% off with more experience. “If they can show that here, I think it has potential to have a transformative effect,” says a Tulane architecture professor. “It’s of interest both to architecture and to developers who are interested in building affordably and fast.” The most important innovation is the construction method itself. The factory feels like the love child of Home Depot and a sterile surgical chamber. “We believe that in factory environments the productivity of the worker is greater,” says a project exec.